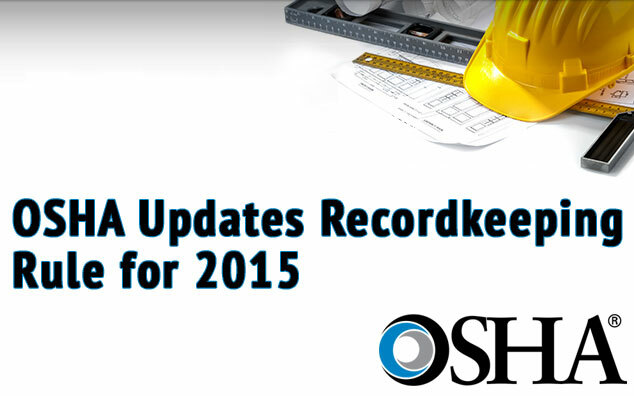 The Occupational Safety and Health Administration’s updated recordkeeping rule includes two key changes. First, the rule updates the list of industries that are exempt from the requirement to routinely keep OSHA injury and illness records due to relatively low occupational injury and illness rates. the Bureau of Labor Statistics (BLS) from 2007-2009. Please note that the new rule retains the exemption for any establishment with ten or fewer employees, regardless of their industry classification from the requirement to routinely keep records. The second update to the rule expands the list of severe work-related and injuries that all covered employers must report to OSHA. This revision maintains the current requirement to report all fatalities within 8 hours and makes an additional requirement to report all inpatient hospitalizations, amputations and loss of an eye within 24 hours to OSHA. Remember that only work-related fatalities occurring within 30 days of the incident must be reported to OSHA. However, incidents such as inpatient hospitalization, amputation or loss of an eye must be reported to OSHA within 24 hours of the work-related incident. If you have any questions regarding how these OSHA changes will affect your business, please contact Bill Trammell at PDCM Insurance, by email at btrammell@pdcm.com. September 22, 2014 in OSHA, Uncategorized.